MLB is high on him so expect him to get a job this offseason. Gil's Take: As we mentioned in May, Scheurwater has been a constant presence on Dale Scott's crew since late April. A quasi-permanent crew assignment for a call-up like this reminds me of Will Little on Gerry Davis' crew during the very season before he was hired to the staff. Saw his first extended MLB action towards the end of last season, I would watch out for him next season; 100 + would be a really good sign. Gil's Take: Whitson's 64 games in the season's first half nearly matched his total MLB experience during his first three years as a call-up. That's a good omen. I expect him to get hired this offseason—the only concern I have is that he has been passed over so many times—but they are still using him so expect him to get a job. Gil's Take: Fagan appears to be getting into Angel Campos territory—a lot of experience over many years, relatively, but his hiring window may be coming to a close. I don't think MLB is done figuring out him yet with the way they have handled him the last couple of years. Gil's Take: The powers-that-be clearly want to see more of Woodring at the major league level, and that's a refreshing step in the right direction for an umpire whose year-by-year game total was 102 (2014), 54 (2015), and 36 (2016). I would expect him to keep getting more games. Gil's Take: At over 100 assignments, Lentz's rookie campaign was very busy. Adding over 50 by the All-Star Break this season is consistent with an approach of trial by fire for a very young umpire that seems to be on the fast track toward MLB work. This reminds me of Jordan Baker's hiring in 2014, though Baker was helped greatly by MLB's instant replay expansion, as he was one of seven umpires hired that offseason. Baker had officiated 72 MLB games in 2012 and 125 in 2013 for a total of 197 games of big league experience at the time of his promotion. I think he will have a job after this season or next season. Gil's Take: Blakney earned his fill-in sleeve number in the same class as Carlos Torres. 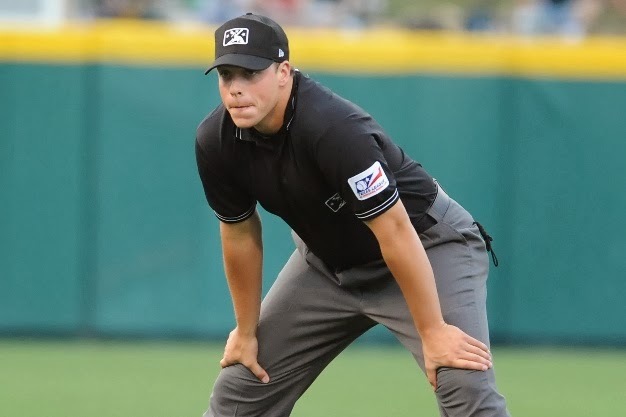 Though Torres was hired prior to the 2017 season, Blakney is also about seven years younger than him and led the entire call-up staff in officiating 142 big-league games in 2016. 50+ assignments through the Break is a lower pace than 2016, but is still a promising vote of confidence from the League. Probably not going to get hired this offseason but he most likely will get a full time job. Gil's Take: Segal has been in Triple-A for six-and-a-half years (PCL: 2011-15; IL 2016-present). It's starting to be a long time at that level of ball, though it's only his second season in the International League. Nearly 50 games in the Majors through the Break, though, is a promising sign. If there are more than three I can see him getting a job this offseason. Gil's Take: The assignment trend reflects a positive development for a minor leaguer ready to break into the first tier amongst call-ups. I don't think he is in MLB's plans, I think he is just a filler until younger people are ready. Gil's Take: It's too early to tell which way the League will go here. May is on pace to match his assignment total of 69 last season; this would appear to be a schedule for a Tier 2 call-up umpire. I don't think he is in MLB's plans. I hope I am wrong but I don't think he will get a job. Gil's Take: There seems to be a phasing out taking place, as Basner's yearly MLB games have decreased from a high of 106 in 2014, to 93 in 2015, 88 in 2016, and on pace for just 40 this season. We will see more of him next year. Gil's Take: Since his June 10 debut, Livensparger has received the most work of the 2017 rookie class. Notably, on June 23, Livensparger had an Obstruction A play in Texas, but employed Type B mechanics before properly enforcing the penalty with the help of his crew, awarding the obstructed baserunner one base, as prescribed by rule. Though the mechanics weren't, the call itself (and the result of the play) was correct. 60+ games would be a good sign for him this season; under 60 would be bad. I don't think he is in MLB's long term plan, but we will see. Gil's Take: Ortiz was a 'tweener last season, in that it would appear that the League needed somebody to fill in, and drew Ortiz's number for a cup-of-coffee or two. This suggests a low tier, but Ortiz is also the freshest non-rookie on the call-up list. I don't think he is in MLB's plan so I would expect him to keep getting fewer games. Gil's Take: Barber didn't make his first appearance this season until late June, but he's been up for the two weeks ever since. I think we will see more of him going forward. Gil's Take: Additon drew a doubleheader debut and has received fairly reliable assignments ever since. 50+ games this season would be a good sign. Gil's Take: I wouldn't get optimistic about 50+ games just yet, but since breaking in during a May 27 doubleheader, Libka has been on standby to fill-in for the vacationing umpire here or there. This is consistent with simply getting a novice umpire more experience. I am surprised they even put him on the fill in list for this season. We will see what MLB has in the plans for him. Gil's Take: We're looking at a similar back-up call-up motif as we were with Ortiz last year. If Nick gets in, it will likely be for a series here or there, to get his feet wet. Umpires 60 or older that may retire in the next couple of years: Gerry Davis, Dana DeMuth, Joe West, Gary Cederstrom, Tom Hallion, Phil Cuzzi, Larry Vanover, Dale Scott (not over 60 but may retire in relation to his April 14 injury). Gil's Take: While West has indicated a desire to remain in the game as he pursues Bruce Froemming and Bill Klem's all-time games-worked records, the others are listed as a portrayal of spots that might be opening for the above call-up umpires.